Blue Dragon is dramatic, luxurious, and spacious. It’s minutes from Gouverneur’s shops and activities, and a short hike from the beach. The villa’s six bedrooms sleep 12 (or more with the sofa beds), and there are seven bathrooms so no one will feel cramped. I love the pool’s gorgeous design, the fitness room’s amenities, and the home’s open layout. Modern villa with magnificent views! Blue Dragon has a way of defying expectations. Panoramic views, modern design, and luxurious amenities make this villa perfect for large groups. On the deck, a heated infinity pool stretches over the hillside facing the sea. Near the pool, there is an outdoor kitchenette, a gas barbecue grill, and an outdoor shower. The kitchenette has a fridge, an espresso machine, and a half bath. A sound system and WiFi run throughout the exterior, and a well-equipped gym is on the pool level. The gym is air-conditioned and features a weight machine, treadmills, stationary bikes, free weights, and HDTV. It also doubles as a game room with WiFi, billiards, a mini bar, and a massage table. Covered balconies wrap around every level and are furnished with lounging and dining space. Nature plays a starring role at Blue Dragon, as the design seeks to integrate the exterior with the interior. Every room has an ocean view, and all the materials are light and airy. The villa is built to unfold over several levels, with bedrooms on each floor. On the main level, there is a living area with ample seating, comfortable sectionals, and an entertainment center with Apple TV, Dish Network, a DVD player, and video game consoles. The living area also has a sleek dining table, board games, and a workspace with a phone, fax, and WiFi. Professional range appliances outfit the kitchen, including an espresso machine, a coffee maker, a juicer, a blender, and wine storage. There’s also a cold room for a chef or butler to store and prepare meals and drinks. One of the bedrooms is on the same level as the living and dining areas, and it has a king bed, a private terrace, and an ensuite bathroom. The other bedrooms are spread across various levels of the property. The master bedroom is upstairs and has a spacious sun deck, a large dressing room and walk-in closet, a king bed, and an ensuite bathroom. Four identical bedrooms are on the ground floor in two separate buildings, each of which shares an outdoor living area and a small kitchenette. Every bedroom, aside from the master suite, has a sofa bed that can accommodate an extra child or adult. 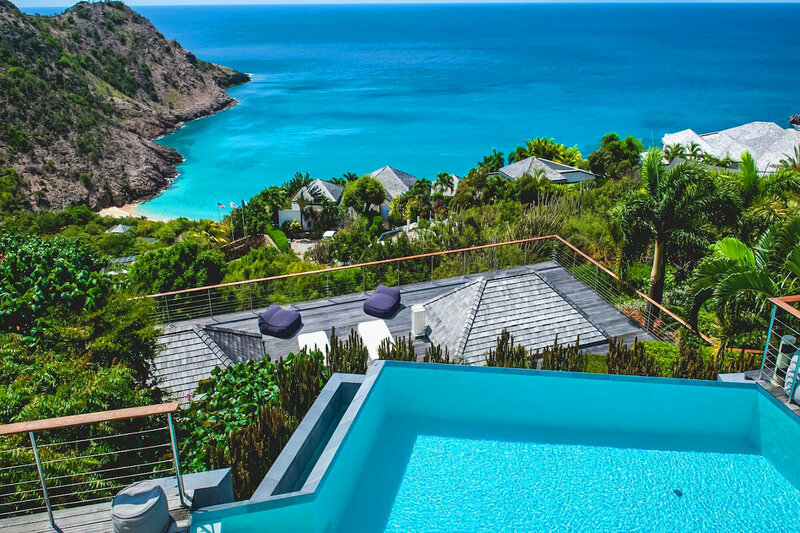 Blue Dragon is one of the highest elevated villas in Gouverneur, but is only a short hike from the beach. It’s also minutes from Gustavia’s shops and restaurants. Gustavia Beach is an approximate 9 minute walk or 2 minute drive from the villa.